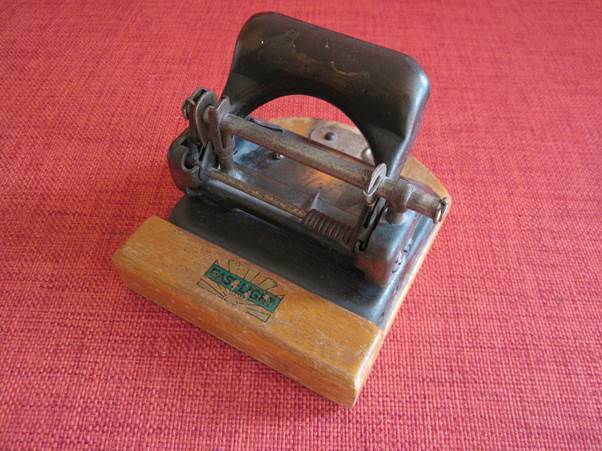 I do like older mechanical items and today I’m looking at a hole punch I have. I know almost nothing about its origins or age. Maybe somebody can tell me more. The punch is made of pressed steel mounted on a wooden base. The maker’s mark appears to be a transfer on the base. It is well worn, but clearly says East-Light in front of a rising sun emblem. My best bet is that this dates from the 1940s or early 1950s so I estimate it at 60 plus years old. It still works and to prove it here’s a page it just punched. Now where do those little discs of cut out paper go? There must be storage space in the wood base and at the back of the hole punch there’s an openable trap door. This can be rotated around the screw that holds it in place. And there we see the little spout for tipping out the waste.